Carnegie Hall at the corner of 57th Street and 7th Avenue in New York City. The John Hersey High School Symphonic and Concert Bands will perform an historic concert in the famous Carnegie Hall in New York City on Friday March 4, 2011 at 8:00pm. The Hersey concert is being promoted by famous New York promoter “Lee Walter Associates” and Hersey will share the stage with another reknowned high school band, William Mason High School, from Cincinnati, Ohio. The concert is being billed “The Best of the Midwest”. These two bands are the first high school bands that Mr. Walter has promoted in his 40 year career of promoting Carnegie Hall and New York concerts. Recently Mr. Walter has promoted such famous events, artists and groups as the Orchestra of St. Luke’s, The Gabrielli Consort, the Van Cliburn International Piano Competition, Peter Schickele’s PDQ Bach, the Vienna Mozart Orchestra, Mummenschanz and The Flying Karamazov Brothers. Hersey and Mason anticipate that approximately 1500 people will attend their concert in Carnegie Hall. This concert showcases four of middle America’s most outstanding student high school ensembles: the John Hersey High School Concert Band and the John Hersey High School Symphonic Band from Illinois and the William Mason High School Symphonic Band and the William Mason High School Wind Symphony from Ohio. They have appeared in numerous nationally and internationally recognized concerts including the National Concert Band Festival, the Midwest International Band and Orchestra Clinic, the French Riviera Reeds Festival, and American Bandmaster Association Conventions. In 2004 Mason Wind Symphony was the first band in the state of Ohio to perform at the Bands of America National Concert Band Festival in Indianapolis. They have marched in the Tournament of Roses Parade, the Orange Bowl Parade and the Cotton Bowl Parades. Hersey will present concerts en route to New York on Thursday, March 3, perform at Carnegie Hall on Friday, March 4, visit famous New York sites on Saturday, March 5, including an exclusive tour with a possible performance on Sesame Street, and drive home on Sunday March 6, 2011. 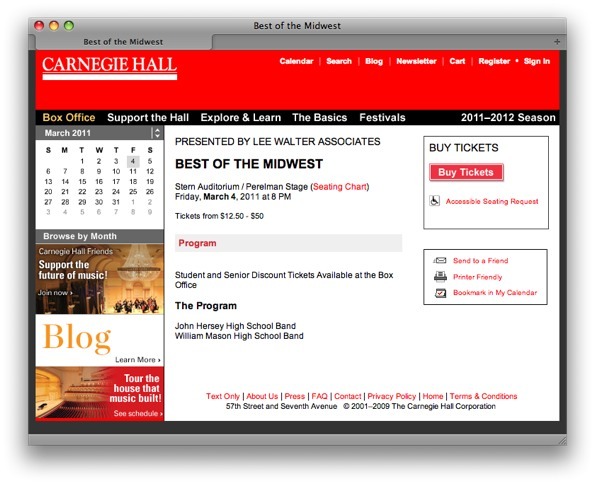 Carnegie Hall website screen shot showing details of Best of the Midwest starring John Hersey High School and William Mason High School Band. Carnegie Hall, opened in 1891, is one of the most famous concert halls in the world. Over the last century many world-reknowned artists have performed there, including Louis Armstrong, Peter Tchaikovsky, George Gershwin, Igor Stravinsky, Duke Ellington and the Beatles, to name a few. The acoustic sounds are impeccable and the architecture extravagant. Additional legendary jazz and popular music performers that have graced Carnegie Hall include Benny Goodman, Judy Garland, Shirley Bassey, Harry Belafonte, James Gang, Nina Simone and Stevie Ray Vaughan, all of whom made celebrated live recordings of their concerts there. Rock and roll music first came to Carnegie Hall when Bill Haley and his Comets appeared in a variety benefit concert on May 6, 1955. The Beatles performed two shows during their historic first trip to the United States on February 12, 1964. Ike and Tina Turner performed a concert there April 1, 1971, which resulted in their album “What You Hear is What You Get”. Chicago recorded their 4 LP box set “Chicago at Carnegie Hall” in 1971. Pink Floyd played Carnegie Hall on May 1 and 2, 1972, performing selections from what would become The Dark Side of the Moon (called “Eclipse” at the time).